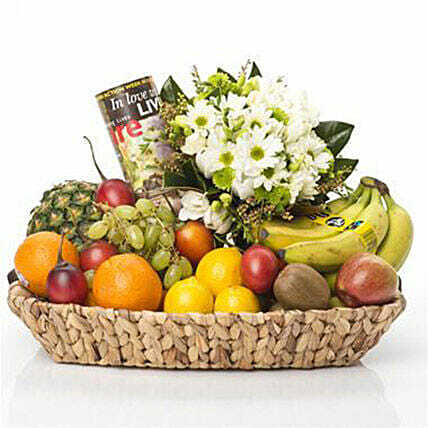 Flowers and fruits are the main ingredients of this bright and beautiful basket of gifts. Some white seasonal flowers are tied into a posy and five seasonal fruits are decorated in this basket along with the latest magazine to make someone’s journey a pleasurable one. All nestled in tissue in a quality basket, which will be wrapped in cello with ribbon trim. Please wash them thoroughly before consumption.